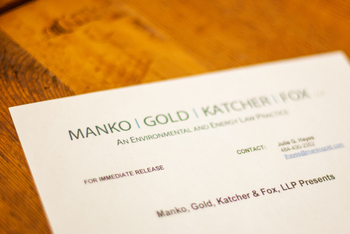 Todd Kantorczyk, a partner with the environmental and energy law firm of Manko, Gold, Katcher & Fox, LLP located just outside of Philadelphia, was sworn in as a School Board Director for the Tredyffrin/Easttown School District. He won his seat on the School Board in contested local elections that took place in November. As a School Board Director, Kantorczyk, who is a resident of Wayne, will be responsible for overseeing the operations of a school district that is consistently recognized as one of the best public school districts in Pennsylvania, and was recently ranked #1 in the nation by Niche.com. MGKF Partner Matthew C. Sullivan, a resident of Wallingford, was also re-elected for a third term on the Board of Commissioners for Nether Providence Township. From 2010 through 2013, Sullivan served as the Board’s Vice President. The Commissioners’ chief responsibilities include supervising Township operations, establishing an annual budget, levying taxes, and passing necessary ordinances. The Board also appoints principal officials to run the day-to-day affairs of the Township as well as volunteer members to serve on the township’s advisory boards, commissions, and committees. Nether Providence was included on Money Magazine’s list of 50 Best Places to Live in the U.S. in 2007 and again in 2015.